1st class & 2nd class. 50% discount on most domestic point to point tickets. Point to Point tickets can be booked with the 50% discount. 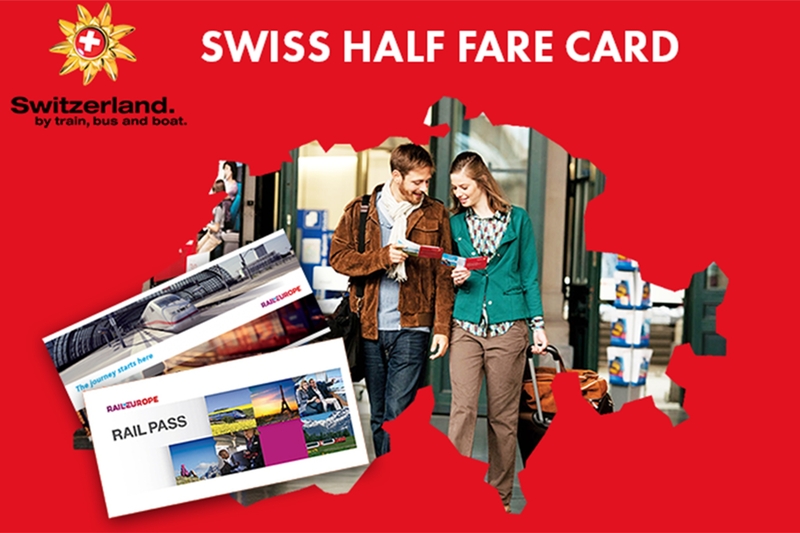 Swiss Half Fare Card Combi can be combined with a Swiss Transfer Ticket or Swiss Travel Pass Flex to provide the same benefits of the Swiss Half Fare Card at a reduced rate. Round trip journey is to be done within 1 month from the onward journey’s date. Children up to 5 included : free if no reservation is required. Unlimited number of children from 6 up to 15 included: free if holding a Swiss Family Card. Children from 6 up to 15 included who are not members of the family: still qualify for a 50% reduction on Swiss Travel Pass, Swiss Travel Pass - Flexi and Swiss Transfer Ticket. Access to scenic routes Bernina Express, Glacier Express, Golden Pass, Wilhelm Tell Express and Lötschberger. Be aware that reservations are compulsory on some scenic trains and fees vary by train. Special Passholder fares on TGV Lyria (France – Switzerland TGV), No passholder fare on services from Geneva and Basel. This bonus is also valid for Swiss Transfer Ticket holders (who have to use a day of transfer). 25-50% discount on Mountain top excursions: applies between the 1st day of free travel and the last day of free travel. Free admission in Museum: valid for the whole duration for a consecutive pass and valid only for the days used (entitled to 50% if they do not use a day, between the 1st day and the last day used). Special travel bonuses: for full list of bonuses, please refer to Swiss Travel System map. Passes are pre-validate at time purchase. Swiss Travel Pass - Flex, date of travel has to be entered in the correct way before boarding the first train, by the traveller, in the corresponding box of the calendar. Passes must be presented unused and prior to the first day of validity for refund. If a passenger is already in Switzerland then the pass must be stamped as unused prior to the first day of validity and then returned to the point of purchase. A 85% refund applies to totally unused passes returned prior to the first day of validity or stamped as unused. Swiss Travel System products are not refundable and cannot be replaced if lost or stolen. A partial refund can be granted in the following cases: illness or accident against presentation of relevant proof documents. A confirmation from a railway office can be produced.